The use of chandeliers dates back centuries, and understandably hasn't been a feature in modern homes for a while due to cost and practicality. 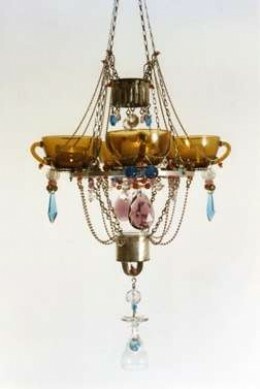 However, the two worlds are now meeting in the form of a modern designed chandelier from found objects. DIY will show you that almost any everyday object can be used to make a chandelier to create some stunning results. The best place to look for design inspiration is in the kitchen; pastry cutters, strainers, whisks, cheese graters, colanders, jelly molds, cutlery and utensils, teacups, espresso cups, shot glasses... anything goes! The objects can then be assembled with wire and chain links, hanging baskets or plug chains. Beads and earrings can be added for a finishing touch. Push egg cups into the whisk end of the mixer attachments, and solder into place. With the vase as a guide, space out these egg cup/whisks evenly around. Remove the vase and place the hoop on top of the whisk handles before sticking into position (I used a glue gun and then wrapped wire around each piece, for added stability). The hoop with egg cup/whisks can now be attached to the inside of the upturned vase, making sure the flat end "stops" of the whisk handles are pushed tightly against the inside of the vase. Attach bead necklace around the vase. Adhere the peel off stickers back to back onto each other, and then onto the plain silver chain. Attach the silver chains from each egg cup, up to the top of the upturned vase. Stick a shot glass to the top of the vase, covering over the chain ends. Put small candles into each egg cup, and hang from the ceiling using hanging basket chains. Designer Madeleine Boulesteix isn't the only one creating chandeliers from found objects. 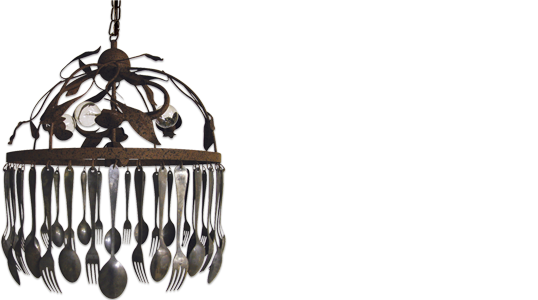 Retailer Arhaus has a spoon and fork chandelier (retailing at $600/ £400) that could be made DIY style easily by using the frame from a lampshade, drilling holes in the handles of cutlery, and hanging this cutlery with wire hoops through the bottom of the lampshade. Adding details with shapes cut from old tin cans, affixed with a glue gun, and finishing with spray paint would complete this look. 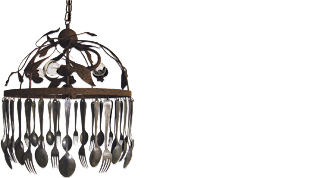 The spoon chandelier pictured would be even easier to recreate by spray painting some hula hoops, and hanging spoons from them with hooks and metal hoops (or even painted shower curtain rings). A more simple design could utilize the hoops from disassembled barrels. By adding mop head fixtures at intervals around the hoop to fix candles into, and painting everything the same color, you have created a basic chandelier easily. For another alternative DIY lighting idea, why not utilize unwanted or unloved lampshades and use them as a basis for some great chandelier creations. Making a chandelier from found objects - DIY style - will not only help the environment by using objects that would otherwise have been garbage-bound, it will also save you money, and add a unique focal point to your home.